Located just 11 miles from downtown Seattle, Renton, WA, is an important bedroom community for the Emerald City. Boasting a history hardly less deep than Seattle’s, Renton was for eons an important salmon-fishing spot for Native Americans thanks to its strategic location on the shores of present-day Lake Washington at the mouth of the Cedar River. Caucasian settlers first arrived here in the 1860s, bringing with them the timber and coal industries. Today, Renton may be most famous as the final assembly plant for the Boeing 737, the best-selling jet airliner in history. 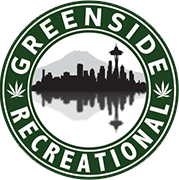 The township is also close to the nearest Renton, WA dispensary: Greenside Recreational. Our friendly and knowledgeable dispensary staff offer the finest selection of cannabis products. Greenside is conveniently located on Highway 99 with easy access to nearby Interstate 5. We’re close to Highline College and convenient to most major South Seattle suburbs. Our experienced —and above all friendly—Renton, WA, dispensary budtenders are always happy to help you find the perfect cannabis product, whether it’s traditional flower, potent and flavorful waxes and dabs, delicious edibles or any other items you’re looking for. We maintain close relationships with local growers and producers so that we can offer you the best cannabis at fair market prices. We’re proud of our great service and our huge rotating selection. For a complete listing of our current stock, visit our online menu.